Suitable for use on Brompton Bikes. Make your Brompton lighter with Ti Parts Workshop titanium components. 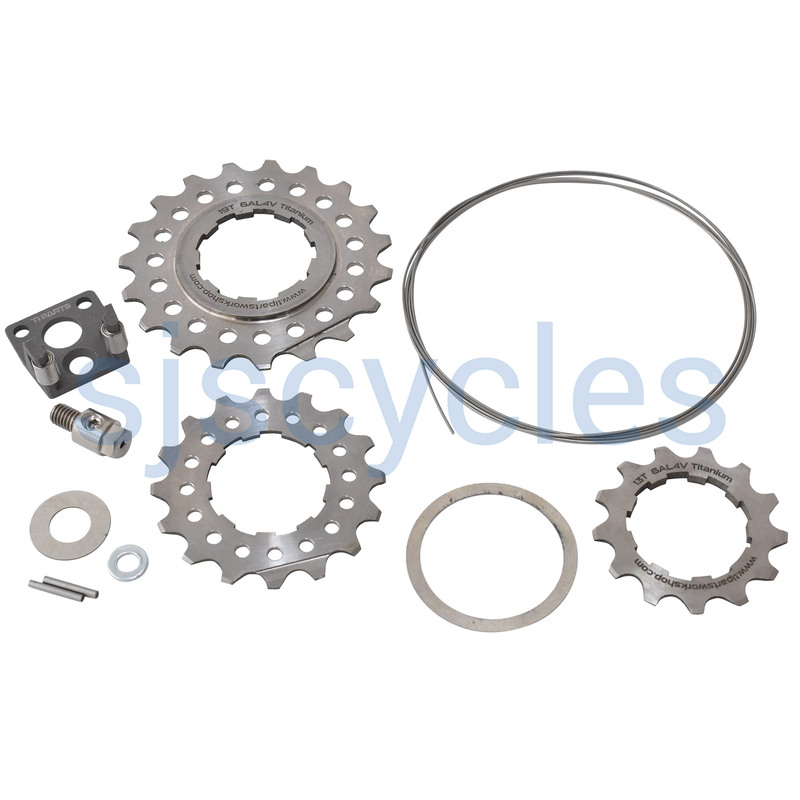 This Rear Cassette Sprocket set saves approximately 6.9g over the original Brompton components. Set consists of three sprockets, one wheel axle, one chain pusher, one barrel nut, one cable, two pins and one washer made in titanium. 6 speed to 9 speed ? Hi, to upgrade my M6L 6 speed to 9 what would I need to have next to this set..? You would need a 3 speed shifter and a suitable chain. Can I use it with 2011 H6L? If I use it, will I get 9 speed Brompton? I will need second 3 speed shifter, what shifter should I take? Will all the kit shift speeds smoothly? Yes, there are many shifters that will work, the Sturmey 3 speed non rotary ones are suitable. Yes you would need a 3 speed shifter. Would this fit a Nickel (super light) Brompton from 2016? I'm looking to go from a 2 speed cog set to a 3 speed cog set on my Nickel Brompton from 2016 super light version. Would this fit? As you have the older model above bar shifter yes this will fit. Is the chain pusher available separately? I'm assuming it's wider than the Brompton one as it has to cover a larger distance to work with three sprockets. Yes the chain pusher is available separately under part #43002. These parts are all a set width. Do I need to change the tensioner or jockey wheel/s or is the complete kit? You do not need to make any changes to the tensioner or idler wheels. You will simply need this kit and a new chain. Is it possible to mix and match? For even spacing between gears I would prefer 12/15/19 - is it possible to customise like this? We are unable to customise the kits, so the option to change the ratios would be purchasing 2 kits. Are the ti sprockets compatible with the standard steel Brompton sprockets? The standard Brompton sprockets will not be suitable, you may be able to find a suitable fitting sprocket from another brand but we have not tested anything. Would you be able to fit these on my bike for me? We can only fit items on to Bromptons or our own touring bikes. If you have these please contact us to book an appointment. Brompton Ti 3 speed conversion. Why can't I use the 13/16/19t set on the titanium triangle please? Is the problem at the 13t, or the 19t end? Unfortunately due to the slightly larger diameter chainstays found on the titanium model the clearances are much tighter meaning that you cannot safely fit the 19T sprocket. Can I use this on a 2017 S2L (with the new gear shifters)? Hi, this kit is for the pre 2017 bikes with old style shifters. Thanks. Do These Sprockets Wear Faster Than The Standard Brompton Ones? As these sprockets are made from titanium they will wear quicker than the standard Brompton steel ones. Can You Supply Fitting Instructions? No fitting instructions seem to be included and it's not been possible to find any online. Can you supply please? Unfortunately no instructions have been produced by Ti Parts for this item so we don't have any instructions that we're able to send I'm afraid. It is normally recommended that a 10 or 11spd chain is used with these sprockets due to their narrow design. Do you have a chart of the gear sizes achieved with this conversion? I have estimated what the gears are and the steps between the gears does not seem very even. I'm afraid there is no chart available specifically for the gearing ratios achieved in this conversion. A generic gear ration calculator like the one on Sheldon Brown's website can be used to compare the ratios manually.